When it comes to your pets, you want to give them the best of the best. They’re your family after all. 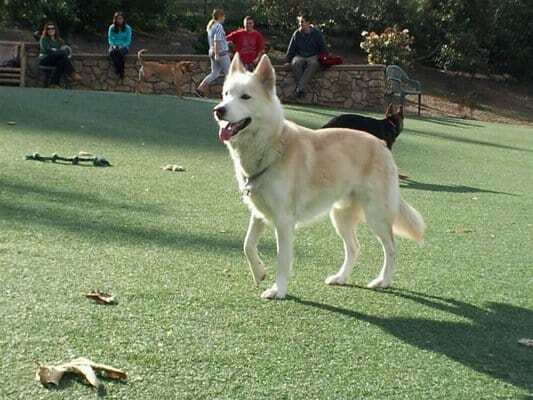 All your furry friends deserve a big yard they can run through, roll around in, and enjoy. On the other hand, you deserve a lawn without brown spots, and that won’t lead to muddy paw prints in the house. That’s where San Diego Home Turf comes in. We have the best of both worlds with an artificial grass product you and your pets can love for different reasons. The number one priority of all our pets is that they’re happy and healthy which means the products they use have to follow strict requirements. Our Pet Turf System has been tested and has no detectable traces of lead or other RCRA hazardous waste heavy metals. Alongside being a realistic lawn alternative, it’s also non-toxic so you should have no worries when letting your pets out to play. 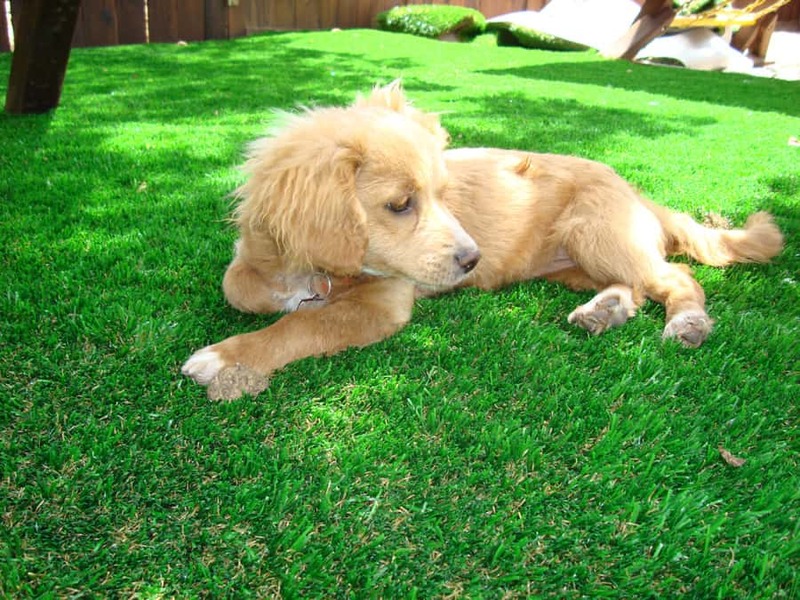 The number one concern for pet owners when it comes to artificial grass is drainage. “Will it be able to survive through pet urine?” The answer is YES! Our backing is perforated for fast drainage and can expel liquid faster than a natural lawn can. Don’t believe us? Even your big dog can’t beat it. It can drain more than 30 inches per hour per square yard. All you need to do is let the dog out, let it do its business, and rinse it down. Done and done. A natural lawn is prone to holes and mud, and the sprinklers getting it wet doesn’t help your cause. Next thing you know, Lassie is in the dirt, digging questionable holes and tracking hundreds of tiny dog prints all over your freshly cleaned carpet. With a pet turf artificial grass system, you not only avoid the sprinklers making mud, but you avoid mud altogether. You can give your dog a hose bath, outside, on the lawn, and you’ll both stay clean. No gopher or mole holes in the dirt will be able to entice your dog to dig in the first place. Your dog won’t be rolling around in the mud that yesterday’s rain left behind. It’s evergreen all the time, and you’ll be celebrating. 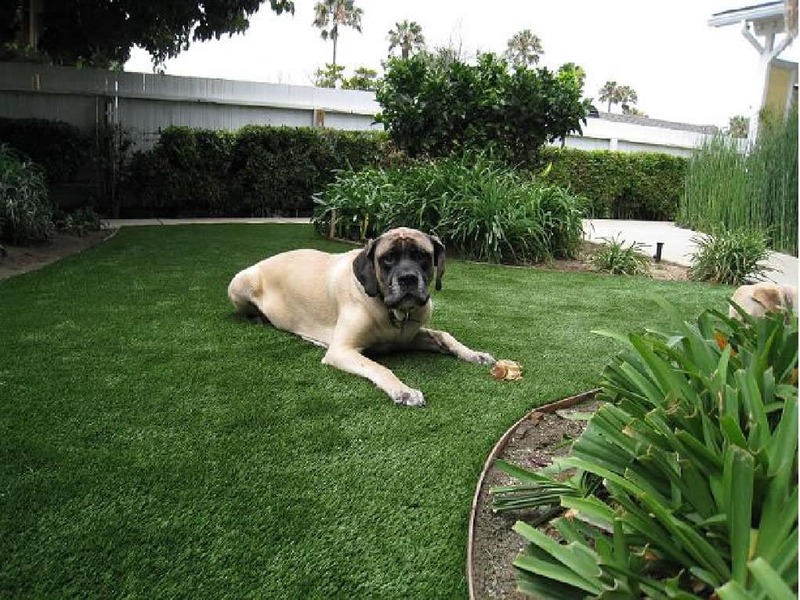 Whether you have one small Chihuahua or six Great Danes, artificial grass is perfect for all your furry family needs. We love pets, and we believe that your yard should compliment both them and you. Take advantage of Home Turf’s Pet Turf System today and give us a call here at San Diego Home Turf.